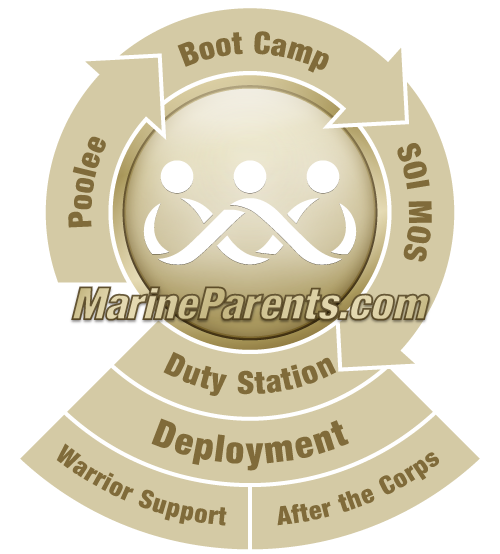 Official New Marine Family Meet and Greet at the Bay View Restaurant each Wednesday prior to Family Day at Marine Corps Recruit Depot San Diego will be held beginning March 6, 2015 for the May 8 graduation class and all graduating classes after May 8. See image below which provides information on the weekly events, sign up location and website. The event is an MCCS (Marine Corps Community Service) function and is not associated with any fundraising activities. They will have Drill Instructors at the event, along with various informational and vending booths. For groups wanting to share slide show presentations, the Bay View does have available internet, 42" TV w/DVD player and projection screen. They do not supply laptop and projector, as they do not have an IT person. The available items, along with power can be set up for use at each event. The TV is capable of displaying laptop presentations through an Ethernet connection. Recruits in boot camp will be provided with flyers, envelopes and stamps to send flyers to their family members.